Nick has written a book that is 1 part philosophy, 1 part memoir, 1 part SAT vocabulary test and entirely a good read. I can’t recommend this book highly enough. A note: for those of you who are offended by the words that people choose rather than the message being conveyed: please don’t read this. There are swears. Here is an excerpt from the print version of the book from the article, sadly it was not included in the audiobook format because… well, you know… it’s an audiobook. Okay: for everyone else, it outlines his growing up in a small town in Minooka, Illinois (Population 700-ish) to getting into theater in Chicago, before “pulling a Schwimmer” and moving to Los Angeles to live a life of Love, Acting and Woodworking. Found in his rules for living a delicious life are lessons that are simple farmer politics and homespun wisdom, but lessons that people everywhere need to learn. His approach to politics (gender and otherwise) is one that is very closely aligned with my own, but put in a funnier more interesting way. If you haven’t guessed at the conclusion of this blog entry at the moment: Read the book. 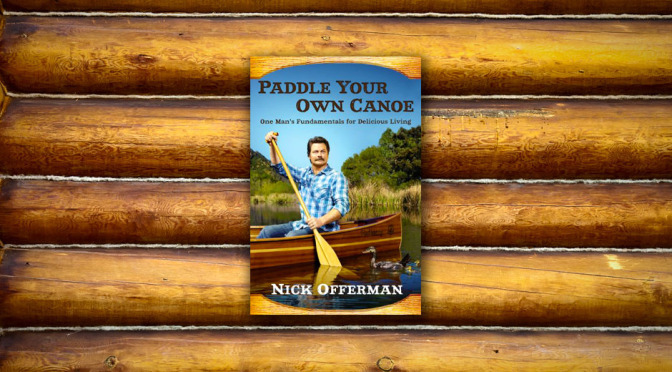 Oh and the audiobook is Narrated by Mr. Offerman, so if you’ve ever wanted the voice of Ron Swanson to read you a bed time story (I know I have), you’re in for a treat. I don’t really care if you get it locally or from the Amazon link below, because I just do this for me; here’s a link that shows you what it looks like.